I tend to be on the skeptical side when it comes to investing based on seasonal trends. I’m almost always of the mind that less is more and seasonality encourages more decision making, not less. Making changes to your portfolio based on this type of study would probably not be in your best interest when taking into consideration taxes, transaction costs, and most importantly, the cost of being wrong. While I think seasonality mostly falls into the fun/interesting category, there is plenty of evidence to suggest otherwise so I wanted to address a couple of seasonal trends which are staring us directly in the face. One of the important things that might get overlooked with seasonal studies is the sample size. Let’s take a look at the “year ending in five” as an example. At first glance, this table below looks really powerful. 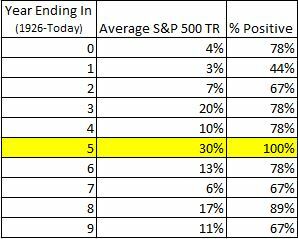 The S&P 500 has never experienced a negative return with a year ending in five. Furthermore, returns have been off the charts, averaging 30% compared with 12% over the entire 89-year period. The problem with this particular study is we have such a tiny sample size; 9 might as well be 0. Also, I don’t know when the unusually strong results were first pointed out, but I’m assuming it was well after the fact. For instance, in 2013, the Dow was up 20 Tuesday’s in a row, which was only recognized after the 19th straight positive Tuesday (tongue in cheek). 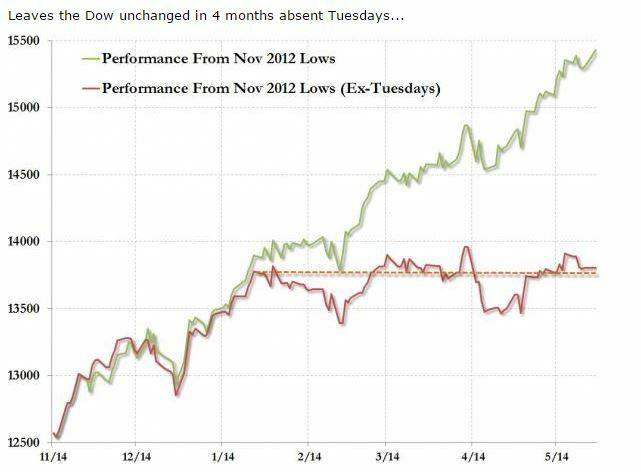 Look at this chart via Zero Hedge. I would put this directly into the fun but useless category. When everyone realizes something unusual is going on and with no fundamental reason to support it, there is a good chance it’s unusual run is about to end. There is no legitimate reason why people would feel better about investing in a year ending in 5 and perhaps this is “phenomenon” is running on fumes. In 2005, stocks were up 4.5% and with just a month left to go, stocks are flat for 2015. 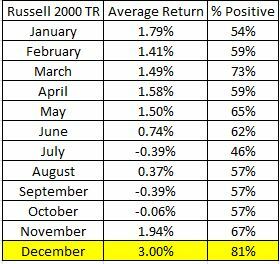 Another area of the market that might have the wind at its back is the Russell 2000 (TR), which has been up the last 7 Decembers and has been positive 29 of the last 36 Decembers, or 81% of the time. If seasonality interests you, I suggest you check out The Stock Trader’s Almanac, nobody does it better.